The December 2012 Transition Network newsletter Is this email not displaying correctly? A bumper round-up this month which contains some of the finest short films about Transition among many many other things. Massive congratulations to Transitioners across Europe as we all win The European Economic and Social Committee Civil Society Prize for 2012. This is great recognition for the work of so many people in hundreds of European local communities who are engaging their local civil society in developing low carbon futures and livelihoods which promote wellbeing for all in the community. The Top Ten films as chosen by Transition initiatives! What are your three best films to screen at Transition events? Following a call for input on Transition Culture, the top 10 films have been announced. Searching for that right-on, head, heart and hands Transition gift? Why not buy an annual subscription to the paper and help us reach our BuzzBnk target? A big festive thank you for all of us here. After publishing our preview issue in the summer, the need for new media now seems more relevant than ever. Hosted by BuzzBnk it will run for 90 days and our target is £15,000 (or more!). For every newspaper printed there is always a hard-working (and usually invisible) editorial crew behind the scenes. In the beginning of Transition the EDAP was sort of the point of Transition. In a conversation about plants a herbalist called Kit said she thought the plant for the Occupy movement should be rosemary. For strength. For keeping the heart and spirits in good cheer. For remembrance. We like to think, as Transitioners, we are classless, but we are not…. (but) the middle class slur is a trap, even in the most enlightened, diverse, open, inclusive Transiton groups. Somehow we have to get out of it. When it comes to hierarchy I shall begin in the chicken shed. We ignore the impact of rank at our peril, in both our personal relationships and organisational transactions. Adrienne Campbell – the spark that lit our stove, our friend and fellow social reporter died in her home town of Lewes. Today we see the woods as somewhere we go to walk the dog, where we have picnics and cycle rides. Our disrespect for trees is a symptom of our disrespect for the environment at large. There is a mindset, which has persisted for thousands of years, that humans can’t possibly damage something as vast as the environment. Using proper tools is not an opportunity you really get in modern life. What happens when a project receives funding, a project that has been entirely volunteer-led, where people have provided their considerable skills and expertise for free? What has this #SHAMELESSPLUG for the TRANSITION FREE PRESS got to do with LIVELIHOODS? More than it appears at first glance! 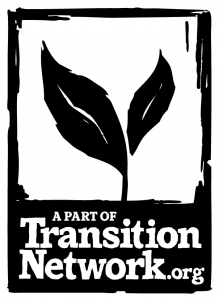 For many people, the highlight of the 2012 Transition Network conference was the ‘Transition Town Anywhere’ activity, where a resilience local economy was built, lived in, celebrated and then taken down again over the space of one morning. Ruth Ben-Tovim, one of the event’s organisers, tells us how the event came about, how it worked, and how you could do a version in your community. She loved wild swimming. It was something we shared, along with a love of all wild things, bees, plants, ancestors, and of course, Transition. While a demonstration gathered in Norwich, only a couple of streets away there was, however, a different story. A small sustainable tale about honouring the elders and finding your roots wherever you are. and still on the money theme, there’s a fantasticreview of 40 crowd funding platforms so whatever you need money for, there may be someone who wants to give it to you! This talk by Kevin Anderson of the UK Tyndall Centre of a lecture at the Cabot Institute’s annual lecture in Bristol is powerful, and essential stuff about climate change. According to Rob Hopkins it « could turn out to be one of the most important 58 minutes you ever spend sat in front of your computer ». With 100% matched funding, Forres Transition are trying to raise $10,000 to convert an existing agricultural shed into an Environmental Education & Healthy Living Centre. Gen Community’s first project in Newport, South Wales, will put solar panels on 240 low income houses, reducing their electricity bills by 25% annually, helping to alleviate fuel poverty. help develop a new agenda for local food practice, research and policy. In Spring 2013, a small group will cycle 1,000 miles from Land’s End to John O’Groats. Along the way it will visit the UK’s most inspiring eco communities, permaculture projects, transition movements, and community kitchens. Applications are now open! Costs: £105 for both days (Bursaries are available!). This is our original training with lots of practical ideas on how to set up, run and grow a Transition Initiative. It is also useful for people who have recently become involved in Transition and want to develop the essential skills and insights to help their initiative become a success. Costs & Booking: £105 for both days (Bursaries are available!). Our partners at The Schumacher College are now opening applications to join their ‘Economics in Transition’ postgraduate course. David Gershon introduces strategies and tools we can use to change behaviour, empower communities and transform large systems.